The North Landing River forms the head of Currituck Sound, part of the coastline of both North Carolina and Virginia. North Landing River (Head of Currituck Sound) Virginia and N. Carolina. 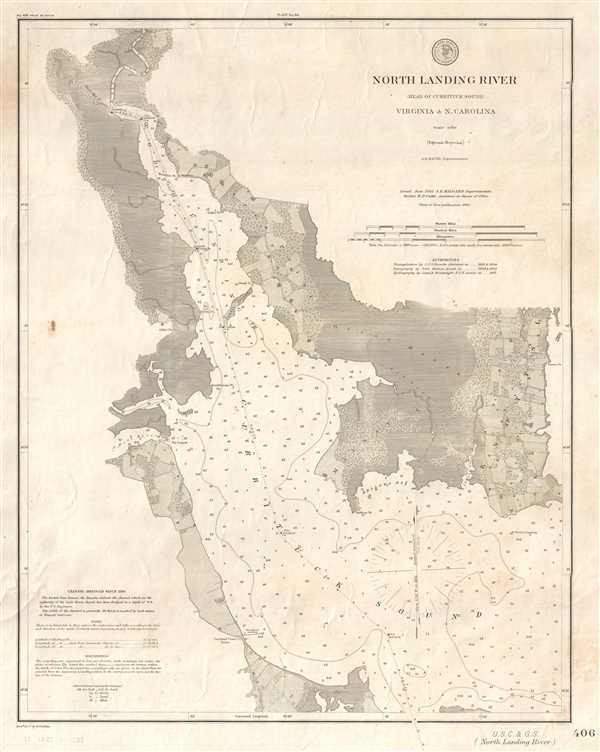 This is a separate issue 1882 U.S. Coast and Geodetic Survey nautical chart or maritime map of the North Landing River, which comprises the head of Currituck Sound, in both North Carolina and Virginia. The map depicts the region from the Pungo Ferry south along the North Landing River to Currituck Sound, including a portion of Knott's Island. A highly detailed chart, myriad depth soundings, measured in feet, are indicated throughout. The channel, which was dredged in 1880, is illustrated with several heading notations to ease navigation. Points, islands, and other landmarks are labeled, and the consistency of the river bottom is noted all along the river. The coastlines are not extremely detailed, although fields, roads, and individual houses are illustrated. The steamboat landing at Currituck Court House is illustrated and labeled as well. This map was engraved by F. Farfax and issued by the United States Coast and Geodetic Survey in June 1882 when Julius Eraasmus Hilgard was serving as Superintendent. Julius Erasmus Hilgard (January 7, 1825 - May 9, 1890) was a German-American engineer and Director of the United States Coast Survey. Born in Zweibrüken, Rhenish Bavaria, he and his family emigrated to the United States in 1835. They arrived in New Orleans on Christmas Day and traveled from there to a farm in Belleville, Illinois. Hilgard went to Philadelphia in 1843 to study engineering. It was in Philadelphia that Hilgard met Professor Alexander Bache, the recently appointed Superintendent of the United States Coast Survey. In 1845, Bache gave Hilgard a position with the Coast Survey, although his official appointment was delayed for some reason until December 28, 1846. Hilgard worked with the Coast Survey off and on for the rest of his life. At the outbreak of the Civil War, Hilgard was engaged in a prominent business enterprise in Paterson, New Jersey, but Bache convinced him to return to the Coast Survey to supplement in the war effort. In 1862, Hilgard 'assumed charge of the Coast Survey office', taking on the duties of Superintendent in lieu of Bache, who had, by this time, become extremely ill. Upon Bache's death in 1867, Hilgard became the de-facto Superintendent as well as the assistant in charge of the office. He served as such until February 1867 when Benjamin Pierce was appointed Superintendent. Hilgard continued to work for the Coast Survey under Pierce as 'assistant in charge of office' until he was formally appointed Superintendent in 1881, a position he held until 1885 when he was forced to resign due to illness. He died 5 years later. Very good. Backed on linen. Light soiling. Blank on verso.